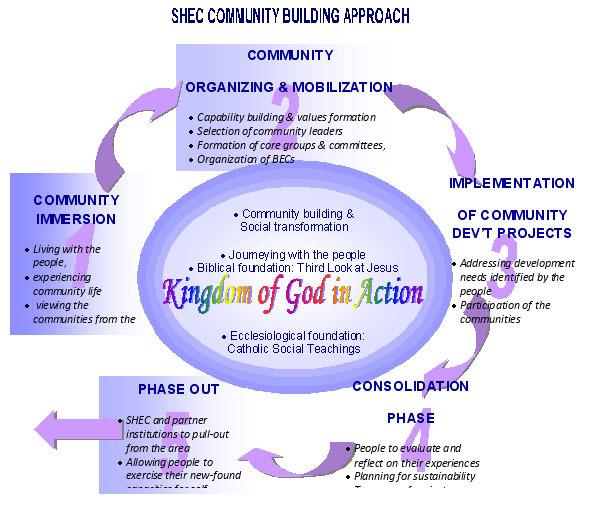 SHEC is founded on the two essentials of the life of Jesus Christ: communion with his Father and the proclamation of the kingdom of God which is centered on the good news to the poor. 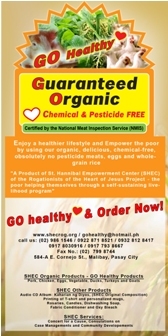 Such preferential option for the poor is very clear in the Old and New Testaments.� Thus, the essence of the empowerment of the poorest of the poor is highly grounded on (i) God�s solidarity with the �Anawim, the poor and oppressed, by liberating them from Egypt; and (ii) on Jesus� life and mission, by proclaiming the Kingdom of God with a specific preference for the poor. �Also, it is remarkable to note that God�s preferential option for the poor in the Old Testament was called by Jesus as Good News to the Poor when he proclaimed the Kingdom of God. God has manifested his concern for people, not souls. This is the God of the Bible who opted to be with his people, the Israelites, especially during their enslavement in Egypt. He journeyed with them all the way, until they reached the Promised Land. Moreover, even after such tortuous journey, He continued to show His unconditional love for them. �The biblical narratives simply present that God had manifested who He was to the people through his actions. He showed that He was a God who cared for, justified and liberated His people. This was clearly and concretely witnessed when He led the Israelites out of Egypt. It was His preferential love for the slaves that made Him known to the people. One way to point this out is through the ensuing passage: I am Yahweh your God who brought you out of the land of Egypt, where you lived as slaves. You shall have no gods but me. The anawim in the book of Isaiah are the really poor ones who are oppressed. They do not mean the spiritually poor. Moreover, according to Abesamis, �the more accurate meaning is �poor and oppressed.��  Literally, �the anawim are the humiliated, the downtrodden, and the abased,� � Barreiro adds. Because of their situation, they can hardly defend themselves in the face of their oppressors. In the life of Jesus, his main preoccupation was to proclaim the Kingdom of God. And the most important aspect of the Kingdom of God is Good News to the poor.�� The mission of Jesus Christ is to proclaim the Kingdom of God. Option for the poor is very clear in his mission statements, teachings and actions. This is translated in bringing good news to them. 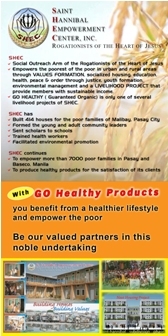 In his mission statements, it stands out that his option for the poor is very unambiguous. Ex 20:2-3 NJB (New Jerusalem Bible) all the biblical passages are taken from NJB. Carlos Abesamis, S.J.,� A Third Look at Jesus, (Philippines: Claretian Publications, 1993), 135. 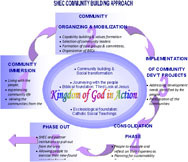 Alvaro Barreiro, Basic Ecclesial Communities: The Evangelization of the Poor (Manila: Claretian Publications, 1997), 14. This has reference to . � the poor have the good news brought to them. (Mt 11:5 = Lk 7:22)� to proclaim the good news to the poor (Lk 4:18). Blessed are you who are poor, for yours is the Kingdom of God (Lk 6:20).